The article contains results of six years of observations of introduced populations of Eupatorium cannabinum L., E. maculatum L., E perfoliatum L. and E purpureum L. Seasonal rhythms of development are revealed, some antecological features are investigated, elements of seed productivity are counted and laboratory germination of seeds is estimated. It is established that the studied species are in the full cycle of seasonal development in the southern taiga subzone of Western Siberia: all species are stable vegetate, bloom and bear fruit. Plants are referred to a group of long-term vegetation and summer flowering period cultures. It was found that the flowers of the Eupatorium are characterized by dichogamy in the form of protandry. Species are inherent by high coefficients of seed productivity and fertility of pollen grains. Size indicators of seeds and pollen grains are stable, have a low level of coefficient of variation. Stratification increases the germination of seeds in two times. The studied species can be recommended for use in mixborders, various compositions of landscape style, in the design of garden reservoirs. Atlas of medicinal plants of Russia (2006). V.A. Bykov (edit.). Moscow: All-Russian Institute of medicinal and aromatic plants (in Russian). Barykina, R.P., Veselova, D.T., Devyatov, A.P. (2004). Handbook of Botanical micro-technology. Moscow: publishing house Moscow state University (in Russian). Beydeman, I.N. (1974). The method of study of phenology of plants and plant communities. Novosibirsk: Nauka. Siberian department (in Russian). Dorogina, O.B. (2007). The importance of reproductive systems in the study of biodiversity and plant adaptation. Siberian Botanical Bulletin, 2(1). 91–94 (in Russian). Fegri, K. & L. van der Peyl (1982). Fundamentals of pollination ecology. Leningrad: Nauka (in Russian). Fyodorov, A.A. & Artyushenko, Z.T. (1979). Atlas of descriptive morphology of embryophyta. Inflorescence. Leningrad: Nauka (in Russian). Golubev, V.N. (1965). Ecological and biological features of herbaceous plants and plant communities of the forest-steppe. Moscow: Nauka (in Russian). Ito, M., Watanabe, K., Kita, Yo., Kawahara, T., Crawford, DJ, Yahara, T. (2000). Phylogeny and Phytogeography of Eupatorium (Eupatorieae, Asteraceae): Insights from Sequence Data of the nrDNA ITS Regions and cpDNA RFLP. Journal of Plant Research, 113(1). 79–89. Kamelina, O.N. (2009). Systematic embryology of flowering plants. Barnaul: publishing house «ARTIKA» (in Russian). Kharina, T.G., Babicheva, N.V., Leshchuk, R.I. (2009). Morphological and biochemical characteristics of Eupatorium cannabinum L. when introduced in the vicinity of Tomsk. Botanical research in the Urals. Perm branch of the Russian Botanical society. 371–373 (in Russian). Kirsanova, N.V. (2012). 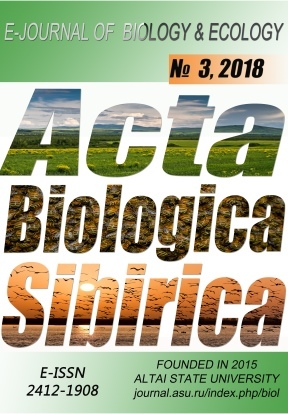 Ecological and biological characteristics of Eupatorium cannabinum L. in connection with introduction in the southern taiga subzone of Western Siberia. Thes is of Doctoral Dissertation. Tomsk (in Russian). Knuth, P. (1905) Guide to flowering biology. Leipzig (in German). Levina, R.E. (1981). Reproductive biology of seed plants. Moscow: Nauka (in Russian). Maysuradze, N.I. (1984). Medicinal plant growing.Methods of research in the introduction of medicinal plants. Moscow: Medicine (in Russian). Nikolaeva, M.G., Razumova, M.V., Gladkova, B.N. (1985). Handbook to germination of dormant seeds. Leningrad: Nauka (in Russian). Patent of Russia on a homeopathic remedy "anapirin-homeopathie" with an antiviral effect (options). Buryakova, I.V., Kurilova, A.I., Badytchik, L.I., Zamarenov, N.A. № 2311194, 24.08.2006 (in Russian). Patent of Russia on the means having antihypoxic effect. Batukhtin, V.A., Shilov, I.V., Suslov, N.I. Kharina, T.G., Babicheva, N.V. № 2392956, 02.03.2009 (in Russian). Pausheva, Z.P. (1988). Workshop on plant cytology. Moscow: Agropromizdat (in Russian). Plant resources of the USSR. Flowering plants, their chemical composition and use. Family of Asteraceae (1991). P.D. Sokolov (Ed.). Saint-Petersburg: Nauka, VII. 114–115 (in Russian). Plants of Crimea: delightful neighbors (2016). Y.V. Plugatar (Ed.). Simferopol: publishing house «ARIAL». (in Russian). Poddubnay-Arnoldi, V.A. (1982). Characteristics of the angiosperms families by cytoembryological characteristics. Moscow: Nauka (in Russian). Ponomaryov, A.P. (1970). About methods and directions anthecological research. Scientific notes of the Perm University. Ser. Biology, 206. 3–10 (in Russian). Pukhalskiy, V.A., Solovyov, A.A., Badaeva, E.D., Yurtsev, V.N. (2007). Practicum on plant cytology and cytogenetics. Moscow: Kolos (in Russian). Rare and endangered species of plants, fungi and lichens of the Rostov region (1996). V.V. Fedyaeva (Ed.). Rostov-on-Don: Publishing House "Paik" (in Russian). Rubinina, A.V. (2005). Eupatorium like designers. News of the florist, 8. 16–18 (in Russian). Serebryakov, I.G. (1964). Comparative analysis of some features of the rhythm of seasonal development of various botanical-geographical zones of the USSR. Bulletin of the Moscow society of naturalist, 49(5). 62–75 (in Russian). Shevchenko, A.I. & Sampiev, A.M. (2007). Aminoacid and mineral composition of the herb Eupatorium cannabinum. News of tertiary education institutions. North Caucasus region. Series: Natural sciences, 4. 92–93 (in Russian). Shilina, T.S. (2016). Obtaining medicines on the basis of the herb Eupatorium cannabinum. Actual problems of medicine in Russia and abroad. 259–262 (in Russian). Vajnagiy, V.I. (1974). On the method of studying the seed productivity of plants. Botanical journal, 59(6). 826–831 (in Russian). Voronina, S.I. (2010). Perennial flowers in garden design. Moscow: Fiton Plus (in Russian). Zverev, A.A. & Zefirov, T.L. (2013). Statistical methods in biology: educational and methodical manual. Kazan: Kazan Federal University Press (in Russian).